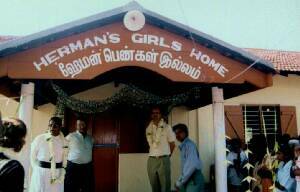 Herman's Girls' Home is located in Periya Nilavanai, in the middle of a battle zone where Sri Lankan forces seek to subdue the Tamil Tiger rebels in control of the northern and eastern provinces of this beautiful island. Periyanilavanai is situated on the southern part of the Batticaloa land strip in the eastern province. Due to this fighting there are a lot of children who do not receive the necessary care to survive. 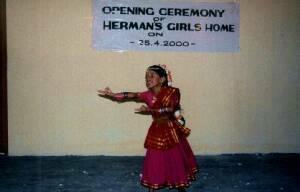 Due to a one time gift of about $22,200 of a man by the name of Herman, a new girls home was established on the 25th of April 2000. The money sufficed also for maintaining the orphanage until November for twenty girls. In the picture, on the left side, you can see Rev. Jeyanesan, who is responsible for the Batticaloa district on behalf of the Jaffna Diocese of the Church of South India. Next to him is the project manager, Mr. Arumay. Joseph Vos opened the Herman's Girls Home on behalf of Herman. Next to him is the deputy principal of the local school. It was a happy occasion for the whole village and many had come from surrounding areas as this definitely gave a spark of hope in a dark and desparate situation for many people. It is so good to see how people around the world show such care for these children. There are many things going on in the building as the orphanage has become like a community center. Celebrations happen here from time to time and so this orphanage has become a ray of light for the people of this village. In the home there are twenty children. There is a day-care center next door which can serve a similar number of children.